Mr. Soluri's love of story telling through music, extended naturally from ballet to opera, and is creating a significant body of operatic work. His 10 minute comic operas are most well known, having been performed frequently around the country, and now around the world - including multiple Carnegie Hall world premieres. Recent seasons have seen full productions of his operas at professional opera houses with EMBEDDED; and the development of his first full length opera, ALBERT NOBBS, which was a finalist in the 2018 Pelicotti Opera Prize and showcased during Opera America's New Works Forum at Merkin Concert Hall. Deborah Brevoort (librettist) and Patrick Soluri (composer) won the first round in the 2018 Pellicciotti Opera Composition Prize for their proposed full-length opera based on the acclaimed novel ALBERT NOBBS. For the final round of the competition, they were commissioned to write 20 minutes of the opera which was workshopped in September 2016. It was then revised, new scenes added, and showcased by American Lyric Theater as part of OPERA America's "New Works Forum" with chorus and soloists at Merkin Concert Hall in January 2018. * Looking for co-commissioners and producing partners to complete this full length work. Currently 30 min in length. The latest in Soluri's series of popular satirical "Figaro" 10 minute operas. This dark, operatic comedy was commissioned by The Fort Worth Opera (Darren Woods, General Director) and written for 4 voices, and piano. There is an alternate orchestration for string quartet and piano. Who knew that the polka could be so dangerous? At a wedding reception in 1993 Jojo and her girlfriends are about to find out. A comic chamber opera for all female cast, with a libretto and scenario by Royce Vavrek. * Scored for String Quartet and piano with 3x Sop and 2x Mez. * also available for solo piano, or piano + solo strings. * World premiere Oct. 19, 2012 at Weill-Carnegie Hall by the Remarkable Theater Brigade. Scored for 18 instrument chamber orchestra and 6 six singers and also available for piano-only. 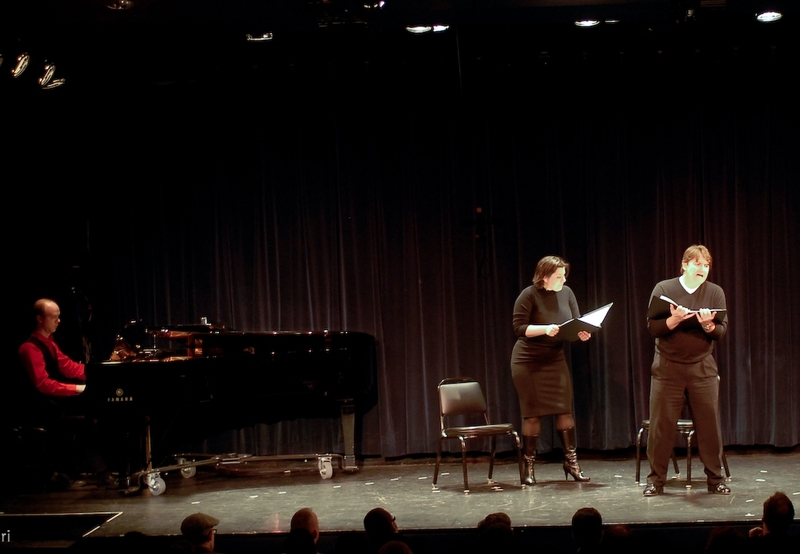 First public showcase on November 1, 2010 at Symphony Space (piano/vocal version). A public showcase with full orchestra and cast was on November 10, 2011 at The DiMenna Center for Classical Music in New York City. It was winner of the Frontier's competition by Fort Worth Opera and received a workshop on May 9, 2013. The world premiere production was performed March 28-30, 2014 by Fargo Moorhead Opera, and at Fort Worth Opera April 24 - May 7, 2016 as part of the co-production. * Full score for chamber orchestra: Fl (pic), ob (E Hrn), cl (bs Cl), bn (C bn), 2hn, tr, Btbn, keyb, 2 perc, 2 vln, 2vla, 2vc, 1db. * Co-production by Fort Worth Opera, Fargo Moorehead Opera, and American Lyric Theater. 3) Die Zauberhünchen (after Mozart) i.e. "The Magic Chicken"
* Scored for String Quartet and piano with Sop, Sop, T.
* World premiere Nov. 10, 2011 at Weill-Carnegie Hall by the Remarkable Theater Brigade. A farce based on the stories and writtings of Edgar Allen Poe, with a libretto co-written by Patrick Soluri and Natalia Boesch. * Scored for String Quartet, optional perc, and piano with Sop, Sop, T.
* World premiere Oct. 1, 2010 at Weill-Carnegie Hall by the Remarkable Theater Brigade. Two patients in a mental hospital are convinced they are Adam and Eve; they obsess over an apple and think their doctor is Satan. Written in collaboration with librettist Quincy Long as 2007/2008 Resident Artist in the American Lyric Theater’s Composer Librettist Development Program and mentored by Mark Adamo. A one act operatic setting of the Fifth Canto from Dante’s masterpiece with English translation by John Ciardi (used with permission). Workshopped with full orchestra and cast May 7, 2003 by New York City Opera during the VOX 2003: Showcasing American Composers and conducted by Steven Osgood. * Scored for orchestra: Pic (afl), 2fl, 2ob, eh, 2cl, Bcl (Eb cl), 2Bn, Cbn, 4hn, 3tr (pic), 2tbn, Btbn, 2 perc, timp, pn, hp, [mandolin], strings. * voices: T, Bar, Speaker, (soloists) 2Sop, 2Mz, T, Bar, B, [SATB chorus]. A short, dark, operatic comedy that combines love, betrayal, beer and an intergalactic rock on a crash course with earth. The first and most performed of Soluri's series of short / 10 minute operas. * available for String Quartet and Piano, or solo piano. Compiled from the Overture and Dies Irae of the opera "Inferno," and performed in concert by the University of Louisville Opera Workshop in October of 2001 with The University Symphony Orchestra, conducted by Kimcherie Lloyd. * Scored for full orchestra & SATB chorus: 2fl, 2ob (eh), 2cl (Bcl), 2bn, Cbn, 4hn, 2tr, 2tbn, Btbn, tba, timp, perc, strings. Performed by Manhattan Virtuosi Chamber Orchestra in the Spring of 2000 with conductor Marlon Daniel at the Great Hall of Cooper Union in NYC. * Scored for chamber orchestra and four soloists: 2Sop, T, Bbar, Speaker, Fl, 2 ob, 2hn, tr(pic), perc, mandolin, harp, strings. 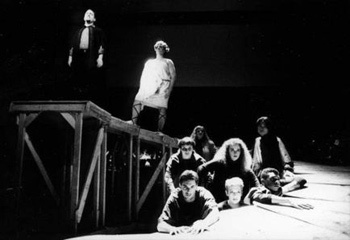 An opera scene commissioned for the finale of the Manhattan School of Music Opera Studies Fall 1999 scenes program A Time Capsule, celebrating time and the new millennium. Libretto by Patrick Soluri. 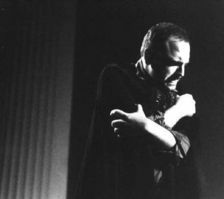 Performed November 19 & 21, 1999 with conductor Gary Wedow of New York City Opera & the MSM Opera Orchestra. * Scored for full orchestra with a large cast of soloists doubling as various characters and the chorus: SATB chorus, 2fl(pic), 2ob, 2cl, 2bn, 4hn, 2tr, 2tbn, Btbn, timp, 2 perc, strings. Opera in three short acts based on Dante’s masterpiece with an English verse translation/libretto by Allison Ryan. Performed with orchestra and cast at Manhattan School of Music March 19 & 21 1999 and produced by Patrick Soluri. * Scored for full orchestra: Fl (pic), ob (eh), 2cl (Bcl), 2bn (Cbn), 2hn, tr, Btbn, tba, timp, perc, mandolin, strings. * Voices: optional chorus, speaker and soloists: T, Bbar, (soloists) 2Sop, 2Mz, T, Bar, B, [SATB chorus].